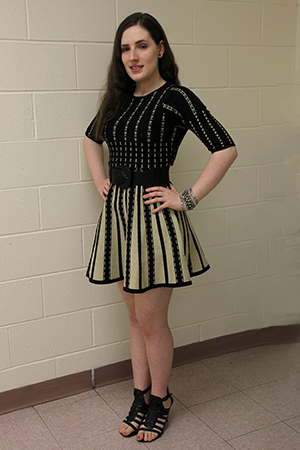 West Windsor, N.J. – Young, talented and motivated Verity Gordon, of West Windsor, earned her associate degree in Fashion/Apparel Design from Mercer County Community College (MCCC) in May. And, in just a few weeks, she will be off to Moore College of Art in Philadelphia, where she will continue her fashion studies for her bachelor’s degree. But this fashion grad has been far from idle since May. She continues to produce signature designs and pursue opportunities to get them onto the runway. 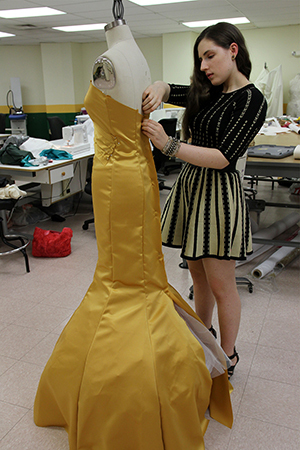 She spent the month of July hard at work at MCCC’s Trenton campus preparing her collection for Small Boutique Fashion Week (SBFW), which runs concurrently with New York Fashion Week in September. She says that she was accepted for the show thanks to an industry professional who vouched for her work. Gordon is creating nine evening outfits for her show on Sept. 11, an event that will feature approximately 50 designers. “For those who are trying to break into this competitive field, this show is an opportunity to get noticed by small-scale buyers, boutique owners, unique shops, celebrity and network stylists, and members of the fashion media,” she explains. The influences for Gordon's designs are a delightful and elegant mix of Greek goddess, exotic bird patterns and 1930s glamour. Her outfits will be fitted for models provided by the SBFW organizers, but the dress she is reserving for the finale will be made for an “average-size person, not a twig of a model," she emphasizes. Gordon notes that significant labor goes into each and every outfit. "It's time-consuming and deadline driven, but I am completely immersed in the process of creating my designs. I took a full course load every semester while I was at Mercer and, in my final semester, I did an independent study with instructor Beth Dubrow,” she said, adding that Dubrow has continued to mentor her over the summer. Gordon says her hands-on skills in design and sewing have improved dramatically while studying at Mercer and, as a result of her independent study, she can now use the Photoshop and Illustrator software programs that have become key in the industry. Gordon is not totally new to high profile runway shows. She was among four college finalists to participate in the Jersey City Fashion Week (JCFW) Young Designers Contest in Fall 2015. The beauty -- and the work -- is in the details for designer Verity Gordon, who graduated from the Fashion/Apparel Design program in May and is preparing nine evening outfits for her New York show. 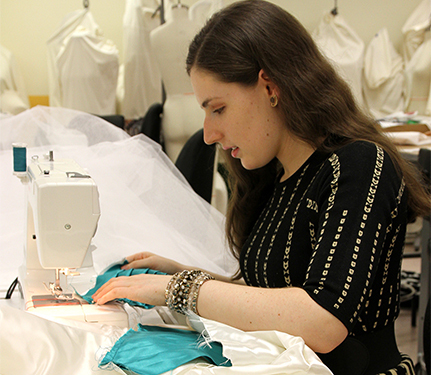 Gordon says her sewing skills have improved dramatically while studying at Mercer. Gordon appreciates fashion and knows how to wears it!